Hunt in the name of the Daedric Prince, Hircine. (Optional) Speak to Mathies, the father of the slain child in Falkreath. Talk to Sinding in Falkreath Jail. Hunt down the White Stag. Face Sinding inside Bloated Man's Grotto and make a choice. A plethora of battles have taken place in Falkreath Hold throughout the eras, and the bloodshed has taken its toll on the small hold capital of Falkreath. The town has the questionable honor of hosting the largest graveyard in all of Skyrim, and the few resident merchants and innkeepers have named their shops or taverns in honor of the numerous deceased warriors. But while the ongoing civil war keeps its distance for the time being, Falkreath still experiences its share of death, as evidenced by a visit to the graveyard. On your first visit you will find town priest, Runil, busy saying the last rites for little Lavinia, the only daughter of local farmers Mathies and Indara Caerellia: "The god Arkay was once like us, bound to winding mortality. But he willingly gave up this existence that we might better understand the vagaries of life and death. It is through the ebb and flow of this cosmic tide that we find renewal and, in the end, peace. May the spirit of Lavinia and all those who have left this world and its suffering know the beloved serenity of Aetherius... and may we one day rejoin them in eternity." After the sad ceremony the three will go their separate ways. Locate the grieving father, Mathies, who can usually be found working his crops behind Corpselight Farm. When asked about his tragedy he will tell you that his nine-year-old, Lavinia, was ripped apart by a laborer named Sinding, now rotting in jail for his deed. The quest will begin and Mathies' last words will be: "What could drive a man to do something like this?" In Falkreath, the jail is built in the basement of Falkreath Barracks. Sinding, the alleged killer, sits in the northeastern cell waiting for his death sentence. When you get close he will approach the bars and you can ask him directly if he killed the little girl: "Believe me, it wasn't anything I ever intended to do. I just... lost control. I tried to tell them, but none of them believe me. It's all on account of this blasted ring." Sinding will then show you the Ring of Hircine and reveal that he is secretly a werewolf who stole the ring from the Daedric Prince of the Hunt in an attempt to control his transformations. In retaliation, Hircine cursed the ring and Sinding's plan backfired; he transformed at the worst possible time, in front of the little girl who never stood a chance. However, Sinding has a plan: "I've been looking for a way to appease Hircine. There is a certain beast in these lands. Large, majestic. It's said that Hircine will commune with whoever slays it. I tracked it into these woods, but then had my... accident with the child. I want to beg his forgiveness. Give him back the ring. But while I'm stuck in here, the beast wanders free." You can now offer to bring the ring to Hircine, and Sinding will gladly accept: "Oh my. You would do this for me? Here, take it. I don't want anything to do with this wretched thing anymore. Seek out the beast. He wanders these woods. Bring him down and... well, the Lord of the Hunt should smile on you. I wish you luck, but should leave here while I still have my skin. Should our paths cross again, I will remember your kindness. Farewell." Without the Ring of Hircine, Sinding will then transform right in front of you and claw his way to the ceiling of the cell where he disappears. When you are ready to leave, the patrolling guard may approach you and notice: "You... you were talking to that murderous savage. And then he escaped. What are you hiding?" NOTE: If you are a lycanthrope, the ring will cause you to randomly transform into your beast form, which may cause a significant bounty if triggered at the wrong time. If you are not infected, the ring's only effect will be to take up your finger slot. 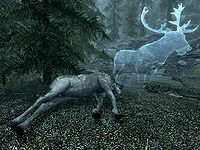 The great beast turns out to be a unique deer named White Stag and can be found in an unmarked clearing east of Falkreath, usually drinking water from a small pond. If you are spotted, the stag will usually howl, then set off at a running pace up the mountain. Do your best to catch up with it, or make effective use of your long-range weapons to hit it. Once you've killed it, the Aspect of Hircine will emerge from the dead stag, talking to you: "I am the spirit of the hunt, just one glimpse of the glorious stalker that your kind calls Hircine." Naturally, as a Daedric Prince, Hircine will have a few extra tricks up his sleeve and will not simply take the ring you offer. Instead he will ask a favor: "I may consider it. But you must first do a service for my glory. The one who stole it has fled to what he thinks is his sanctuary. Just as a bear climbs a tree to escape the hunt, but only ends up trapping himself. Seek out this rogue shifter. Tear the skin from his body, and make it an offering to me." At this point, you can accept or decline, but it will make little difference; you are to travel to Bloated Man's Grotto, or someone else will do it for you. Bloated Man's Grotto is a small cave between Falkreath and Morthal, normally inhabited by bears and spriggans. During the quest, however, you will encounter the remains of a small hunting party, with three of the members, Batum gra-Bar, Ma'tasarr and Hoddreid, already dead. A fourth member, J'Kier, is still alive, but fatally wounded. When you approach him, he will say: "The prey is strong. Stronger than the hunters. But more will come. Bring him down, for the glories of Lord Hircine." The wounded Khajiit will then drop dead. Loot the corpses and a locked chest behind the camp, then follow the northern path until Sinding appears on a rock above. He will be confused as to why you are there to hunt him down: "I can't stop you if that's what you want to do. Hircine is too powerful. But if you spare me, I can be a powerful ally to you. And I would promise to never return to civilized life. I know now that I can't live among people." He will then wait for your response, and your decision will not only affect the reward, it may also affect your achievements. If you choose to follow Hircine's will, you will have no choice but to challenge Sinding, who will respect your decision: "So be it." After that, he will jump down from the ledge, and you must hunt him down. At this point, several hunters will spawn in the cave, all of them under oath to the Daedric Prince, and they will all go for Sinding. Make your way up the stairs to the northeast and pass through the small ruin. As you make your way down in a western direction, you will stumble upon the bodies of several dead hunters, all of them too weak to kill Sinding. When you reach a small streamlet, Sinding should be finished with the hunters and will come rushing towards you. You will have no choice but to pick the fight and slay him. Activate the dead body and claim his skin, and the Aspect of Hircine, a ghostly version of Sinding himself, will manifest before you, saying: "You've done well, hunter." When told that you did as commanded, he will respond: "And found my favor. That skin will serve you well, child. Look more closely at it. My glories shall protect you from all this world's grievances. Good hunting." He will then remove the cursed ring, and change Sinding's skin to the reward, the unique Savior's Hide. Savior's Hide is the only cuirass in the game with a resist magic enchantment. If you choose to go against Hircine's will and spare Sinding, he will gratefully thank you and encourage you to hunt with him. Find the northeastern stairway, and join Sinding on the cliff. As you move forward, you will encounter the first two hunters, Rissing and Tsrasuna, both of them hostile. Defeat them and be careful not to hit Sinding, or he will turn hostile as well. Keep moving forward and face another wave of hunters, including Torkild the Fearsome, Yar gro-Gatuk and Eriana. Follow the path back to the campsite where three more hunters, Ra'kheran, Heratar and Ahjisi, will attack you and Sinding. When all the hunters are dead, approach Sinding: "Thank you for your help. I will make my home here, away from anyone I might hurt." This will end the quest, with no reward. However, when you exit the grotto, you will encounter the Aspect of Hircine once again, as you failed to follow his wishes. Two options are available, and will both lead to the same conclusion: "By bringing down my other Hunters, you turned the chase inside out. And they were no base prey. You continue to amuse and impress. Go forth, with my blessing." He will then remove the curse from the Ring of Hircine and let you keep it as a reward. 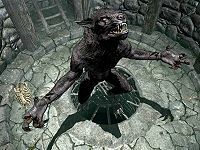 The Ring of Hircine allows werewolves to transform an unlimited number of times per day. Talk to Sinding and tell him you will spare his life. Help Sinding eliminate the remaining hunters. Make sure to save your game at this point! Tell Sinding that the Hunters are dead, exit the cave and the Aspect of Hircine will appear again, granting you the Ring of Hircine. Go back into the cave, give both rings to your follower/place in chest, kill Sinding, take his hide and receive the Savior's Hide from Hircine. Tell Sinding that the Hunters are dead. Kill Sinding, take his hide and receive the Savior's Hide from Hircine. Exit the cave and the Aspect of Hircine will appear again, granting you the Ring of Hircine. It is possible to get the Savior's Hide and both Rings of Hircine, but you must have transformed to be able to do this, as you cannot unequip the ring otherwise. Opt to kill the hunters rather than Sinding at the start of the quest. Talk to Sinding and place the Cursed Ring of Hircine in a chest in Bloated Man's Grotto or give it to a follower. Exit the Grotto, and receive the ring from the Aspect of Hircine. Go back, kill Sinding and take the skin from his body to receive the Savior's Hide. Retrieve your Cursed Ring of Hircine from the chest or follower. Note: If you attempt to heal Sinding he will turn hostile. Help Sinding and kill the hunters. Place cursed ring in chest. Go outside. Hircine will talk to you. Don't respond. Exit the conversation and go back to the cave. Kill Sinding, skin, talk to Hircine (the one inside the Grotto) and get Savior's Hide. Place Savior's Hide in chest. Go outside. The other Hircine will still be there. Talk to him and get the good ring. Go back to the chest inside and get the cursed ring and Savior's Hide. Kill Sinding and take the skin from his body. Hircine will talk to you. Don't respond. Exit the conversation and exit the cave. Outside the grotto receive the purified ring from the other Aspect of Hircine. Go back inside, turn in the skin from Sinding's body to receive the Savior's Hide. As you can't enchant Resist Magic on any armor, Savior's Hide is a valuable piece of armor for someone who wants to achieve the maximum level of magical resistance. If you acquire the Ring of Hircine and the Savior's Hide, both will count towards the Oblivion Walker achievement, allowing you to earn the achievement without completing one of the "required" Daedric quests. However, the "Daedric Quests Completed" statistic (in the General Stats section of your log) is only incremented once. This issue has been addressed by the Unofficial Skyrim Patch; it now prevents you from obtaining both rewards. It is possible to find Sinding wandering Skyrim if you should choose to let him live. He will not attack you, but cannot be interacted with in any way. After completing the quest and leaving the Grotto, the dead hunters will disappear, along with the loot that is on them. If you need to make more than one trip, make sure to loot everyone before leaving and place the items inside the chest. If you exit the dialogue with Sinding after meeting him in the Grotto, or allow it to time out, it counts as having chosen to kill Sinding. Be very careful if you choose to help Sinding kill the hunters, as accidentally striking Sinding three times will cause him to turn against you. Similarly if you are in werewolf form and use the Howl of Fear three times, it will turn him hostile. This quest will completely alter Bloated Man's Grotto, but it will reset to its non-quest form one in-game month after the death of Sinding if you don't enter it during that time. It's recommended to visit Bloated Man's Grotto before doing this quest if you want to loot Bolar's Oathblade without killing Sinding. If you chose to save Sinding, the grotto can be reverted to its non-quest form by opening the console and entering the codes prid 95586 and disable. Entering Bloated Man's Grotto during the quest will adjust the in-game time to 11pm, unless you enter the location between 7pm and 2am. When siding against Sinding, it is possible to save the hunters through various means, such as rushing Sinding with the Slow Time shout. The hunters themselves have only generic greetings and will make their way to the grotto exit once Hircine has given you the reward and disappear from the game. When the Cursed Ring of Hircine equips itself, it will not unequip any ring you are currently wearing, allowing you to wear two rings at once. 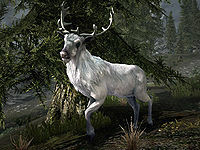 It is possible for the White Stag to relocate to a location outside of the playable world, making it impossible for you to reach him and progress the quest. Use the console command tcl (make sure you have nothing targeted) to disable collision, enabling you to float towards the White Stag to kill it. Upon returning to a valid location use the same command to enable collision and resume normal gameplay. When leaving the jail after accepting the quest, if you don't wait for Sinding to transform and escape, he may remain there even after he is supposed to be making his way to the Grotto. It may be possible to complete the quest normally by moving him outside of the cell using moveto player console command and then exiting the barracks immediately. Casting non-offensive spells at Sinding (including healing spells) counts as striking him, therefore healing him three times will turn him hostile towards you. Sinding may not come to the bars when you enter the jail, making it impossible to talk to him. Leaving and entering the jail a second time usually fixes this. 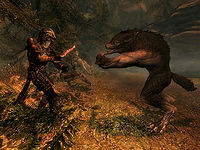 If you change to beast form and then return to normal, you will be able to remove the Cursed Ring of Hircine (since transforming to a werewolf removes all items you are wearing). If you have installed Dawnguard, transforming into a Vampire Lord accomplishes the same thing. If you are riding a horse when the cursed ring transforms you into a werewolf, the camera will stay focused on the horse, even though you are not on it. You will need to wait to turn back into your regular form, then mount the horse and dismount it to get back to a normal camera view. This will also remove the ring. When Sinding attempts to escape after giving you the ring, it's possible he will fail, leaving him standing in the cell. The guards will tell you he escaped, and the hunters at Bloated Man's Grotto will still die, but returning to the jail will find Sinding still in his cage. If you then kill him in his cell, there may be two of him, one with and one without the essential flag. If this occurs, this will make the quest impossible to complete as the one you are supposed to kill will be the one with the essential flag. 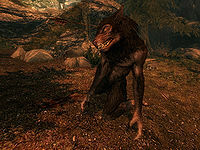 Sinding (as a werewolf) may be found back at the Falkreath Barracks, and killing him there and taking his skin will still trigger the appearance of the Aspect of Hircine, allowing you to gain the Savior's Hide long after the quest in question has been completed. After completing the quest by letting Sinding live, there may be two copies of him in the cave, both in werewolf form. When first encountering Sinding in Bloated Man's Grotto he may not engage you in conversation, but instead proceed to attack the hunters. However, he will be unable to properly engage them in combat and they will not be hostile to you either. You can attack and kill them, but you can't engage Sinding in conversation, making it impossible to complete the quest. ? Exit from the grotto and reenter; now the conversation should be unlocked. If you attack Sinding in beast form, he may not become hostile and the option to skin his corpse may not present itself. If you chose to kill Sinding and skinned him in Bloated Man's Grotto, you may find his dead body also in the prison cell in Falkreath. Guards will still insinuate that you helped him escape. ? If you sided with Sinding and left him alive at the end of the quest, and exit and re-enter the grotto before receiving the Ring of Hircine reward you may find the grotto completely empty, hunter's bodies removed, and with Sinding nowhere in sight. ? 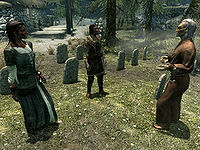 10 There are stories in Falkreath of a strange vagrant who savagely killed a little girl. 20 I've met Sinding, a werewolf who the Daedric Lord Hircine has punished by preventing his transformations. He's given me the ring he stole and asked me to entreat Hircine for forgiveness. 50 I've met Sinding, a werewolf who the Daedric Lord Hircine has punished by preventing his transformations. Hircine has asked me to finish the job and gain his favor by killing Sinding. 70 I've met Sinding, a werewolf who the Daedric Lord Hircine has punished by preventing his transformations. I'm going to defend him against the hunters that Hircine has sent to end his life. 100 Finishes quest I met Sinding, a werewolf who the Daedric Lord Hircine had punished by preventing his transformations. I helped kill him as a service to Hircine, and have been rewarded with the Savior's Hide. 105 Finishes quest I met Sinding, a werewolf who the Daedric Lord Hircine had punished by preventing his transformations. I defended him against the hunters that Hircine sent to end his life, and earned his friendship. The following empty quest stages were omitted from the table: 0, 200, 210. On the PC, it is possible to use the console to advance through the quest by entering setstage DA05 stage, where stage is the number of the stage you wish to complete. It is not possible to un-complete (i.e. go back) quest stages, but it is possible to clear all stages of the quest using resetquest DA05. This page was last modified on 15 December 2018, at 15:47.